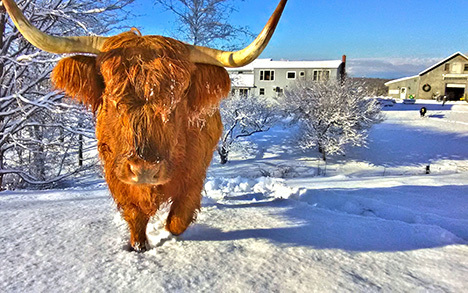 Angelina, a Miles Smith Farm Scottish Highlander cow, was DNA tested to determine her sire. 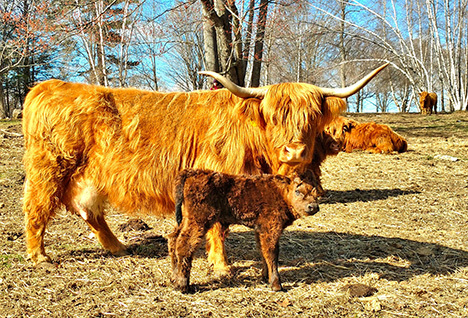 Scottish Highlander cow, Angelina, with her calf, Riley, at Miles Smith Farm. Determining the paternity of a calf can be done with a DNA test. Usually, he's gone to another owner before his libido acts up. But if not we'll pasture him with steers or other bulls... in a monastic boys-only situation. Breeding season on our farm is from mid-July to August 31. One bull can service a herd of 20-25 cows. Add more cows, and another bull is needed. To be sure that all my 30-plus cows become pregnant, I will sometimes put two bulls in the pasture. It is with great pleasure that Southern New Hampshire University (SNHU) congratulates the following students on being named to the fall 2018 President's List. Original owner of Jitters is back. So glad! We had a wonderful breakfast on Sunday. Buffet was open. We chose off the menu. Eggs Florentine, perfectly cooked. Omelette amazing. Coffee as remembered was sooo good. Staff very friendly and attentive. We felt at home. We will be sure to frequent this wonderful relaxing cafe in the future. Don’t miss out, Pittsfield people! It is with great pleasure that Southern New Hampshire University (SNHU) congratulates the following students on being named to the fall 2018 Dean's List. Eligibility for the Dean's List requires that a student accumulate an academic grade point average (GPA) of 3.5-3.699 and earn 12 credits for the semester. Due to title issues related to the town owned property, now known as 33 Main St., the sale the BoS approved to James Gamble hasn’t taken place. The board is concerned that progress has ground to a snail’s pace and we must do something to get it moving forward again. Therefore, the select board has decided to again solicit interest in rehabbing this historic (by Pittsfield standards) and rather uniquely architectured building in order to return it to its former prominence and place on the tax roll. Originally constructed as a single-family home it was converted to a multi-family residence more recently. It has potential for business/commercial uses with the possibility of residences on the upper floors only, based on current zoning in the Commercial District. If Article 2 on the March ballot passes this building could once again be used as a single-family home (currently not an allowed use) as well. Any party who would like to put forth a plan for the property, including a purchase price offer and as detailed a use and rehab description as possible, must submit same to the Select Board’s office at the town hall by 5 PM February 12. As before, the planning board will give their opinion on submissions and two public hearings will be held before the select board makes a decision. A bad fire on Swett Rd. last week could have been much worse had the one occupant not been aware of the flames. Fire/rescue, police, and highway are working together like a well-oiled machine to assist each other and minimize damage, however, people must take responsibility for themselves as well by arming their home with smoke alarms and a plan to get out. Pretty simple precautions to save your life. Come join us for a group meditation open to all levels of experience. Kaitlin Warneke, Licensed Massage Therapist at the Sanctuary Bodyworks and Sauna will be holding a space for deep meditation January 25th, 6:30 pm. The benefits of meditation is for everyone, whether you are a looking to hone your meditation skills, learn new tips for meditation, or simply looking for a great space to relax and rejuvenate. Music will be used for ambiance and live drumming will be used for this meditation. Feel free to bring pillows and blankets. This event is held every month on the fourth Friday at 6:30pm. Contact Kaitlin at (603) 233-2362 to reserve, as space is limited. This event will be held on the middle floor of the Locke building, inside Powerful You Yoga Studio at 175 Barnstead Rd, Pittsfield NH 03263 and is $10 if you book in advance, $15 the day of the event. 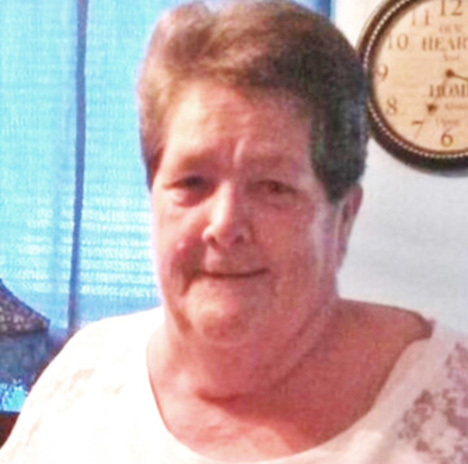 Gail was a wonderful woman who brought laughter and happiness to everyone she met. She loved and cherished her family. Butterflies, lilacs, fishing, bingo, and manicures were among the things she enjoyed most. 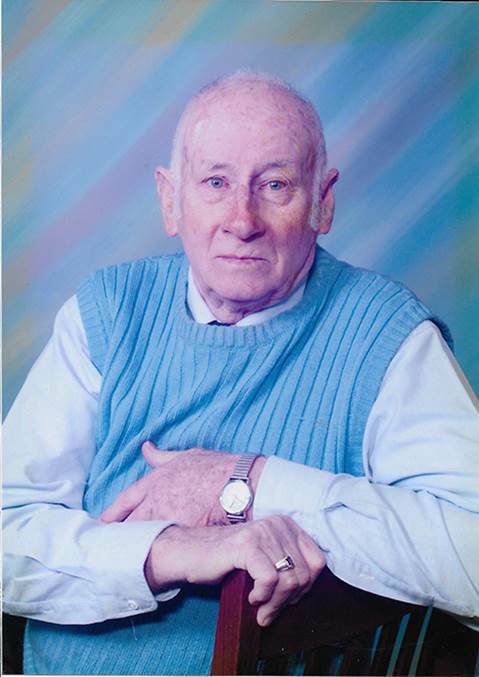 Arthur W. Colby, 92, left us on January 16, 2019 while a resident of Havenwood Health Services in Concord, NH. He was born July 23, 1926 in Concord, NH to Harold R. and Eleanor (Davis) Colby. Arthur was a devoted employee of the NH DOT- Traffic division for 40 years, retiring as a stencil truck foreman in 1989. After retiring he conscientiously dedicated much of his time to the Town of Loudon, installing road signs, mowing the 106 intersection, caring for the Veterans War Memorial, which he researched and had fifty-four names of Vietnam Veterans added to the memorial which were not on there. For several years during the 60`s and 70`s Arthur worked part-time for the Loudon Police Department. He was devoted member for over fifty years of the Loudon Fire Department of which was a big part of his life. In his younger years he went on fire calls and countless fire training. As years passed, he took great pride in painting the old fire station and other projects inside the fire station. The biggest honor of his life was to have his name on the new police/fire safety complex. The Arthur W. Colby safety complex. He watched over the fire station every day and was very proud of the members of the police and fire departments. His example of community services to the Town of Loudon serves as an inspiration to all of us in our daily lives. Arthur was named Loudon’s first Citizen of the year in 1993. A surprise and honor to be chosen. He was also a fifty-year member of the Corinthian Lodge No.82 F & AM of Pittsfield. Arthur is predeceased by his parents, brother, Harold R. Colby and nephew, Robert Colby. Members of his family include his beloved wife, Lucille; son, David and his wife, Kate; son, Dana and his wife, Kim; daughter, Pat Bigwood and her husband, Bob and three grandchildren, Daniel Bigwood, Scott Bigwood and Carly Colby. The Colby and Bigwood families would like to extend our heartfelt appreciation for the loving care Arthur received while at Havenwood Health Services. The first-floor staff and all supporting employees helped Arthur during this difficult time. Their smiles and loving care were a great comfort to his family every day. We will be forever grateful to everyone who cared for Arthur. Visiting hours will be held on Wednesday, January 23, 2019 from 4 to 6 PM at Bennett Funeral Home, 209 N. Main St. Concord. A funeral service will take place on Thursday, January 24, 2019 at 11am at the Loudon Congregational Church, Church St, Loudon, NH. In lieu of flowers the Colby family would like donations sent to Loudon Firefighters Association, 55 South Village Rd, Ste 5, Loudon, NH 03307. Fond memories and expressions of sympathy may be shared at https://www.BennettFuneral.com for the Colby family.